We’re delighted to be bringing Girls Names back – this time, to Night People! It stands to reason that many vital albums come critically close to never being made. 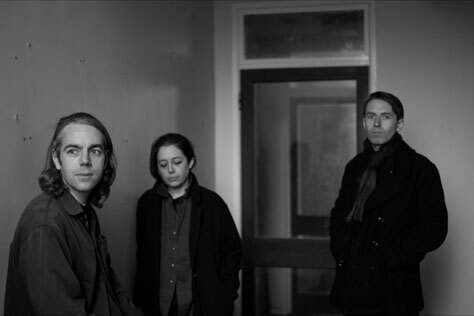 The eight-track upshot of doubt, upheaval and financial strain, Stains on Silence by Girls Names is one such release. Where AAAV proved a brazen statement of intent, Stains on Silence bounds forth as its feature-length comedown. What could have seen the band buckle became an opportunity for approaching things tabula rasa. During its two-year transmutation, Cully, bassist Claire Miskimmin and guitarist Philip Quinn had a single aim for their fourth album: to make an old-fashioned record clocking in around 30 to 35 minutes in length that made the listener reach straight for repeat. From the Bang Bang bar-summoning swoon of opener 25 and the submerged disco doom of Haus Proud to the rapt, dub-leaning Fragments of a Portrait, Girls Names have excelled in their goal by forging an LP of synchronous nuance and defiance. Marked by the presence of drum machines and programming throughout, these eight masterfully woven tales are once again commandeered by founder Cully, whose words, understated yet defiant, mine purpose and meaning from the mire (‘I want to bathe again, I want to swim again / In a pool of twisting bodies, blackened gold’ — 25). But while Stains on Silence came critically close to never being made, having lived with it, reconfigured it, and guided its metamorphosis from flickers of inspiration and half-formed schemes, it’s both a statement of pure perseverance, and a head-on confrontation with ambivalence that couldn’t be more assured. Local support is Secret Admirer, the solo project from Nick Ainsworth of Former Bullies and Dinner Party fame. In 2016 he released a 20-song self-titled tape via Belfast’s CF Records. He will be joined here by his live band.